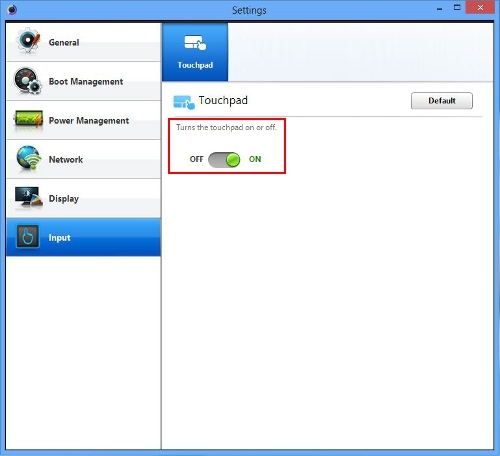 How To Disable/Enable The Touchpad (Windows 8) in NP900 PC? In order to enable/disable your touchpad, you will need to use the Settings software. If you do not have Settings installed on your computer, you can install it using SW Update. Launch Settings by clicking on the app in the Start Screen or clicking on the icon on the desktop. In the Settings window, click on the Input tab. Important: The options and tabs in Settings are model specific and you may not see all of the options in the picture above on your notebook. On the Input tab, move the slider to On or Off to enable or disable the touchpad.